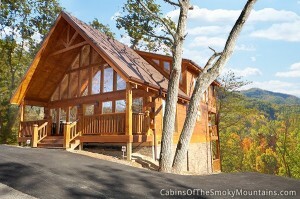 Let’s find a secluded 3-bedroom mountain getaway with gorgeous views of the Smoky Mountains and some peace and privacy. Let’s make it a chalet-style cabin with vaulting ceilings and lots of glass and light through the windows. Let’s call it “Mountain Memories Retreat“. Tucked away in its own world but with good driveway access, and resort amenities close at hand such as conference center and wedding facility access, Mountain Memories Retreat is close to Pigeon Forge and Dollywood, yet far enough away not to care, unless you want to run and visit. Three King bedrooms and full bathrooms – one with jacuzzi – and another half bathroom and three queen sleepers means the cabin can accommodate up to 12 people in comfort. 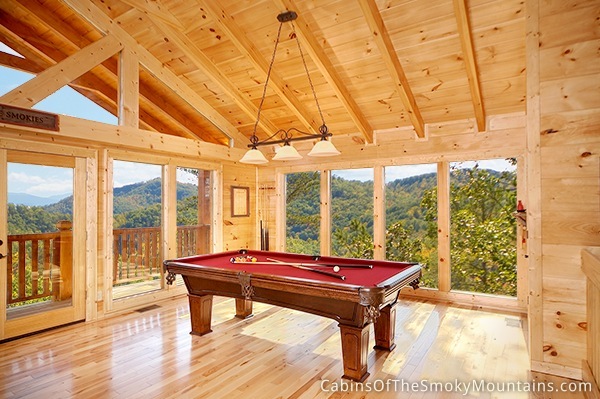 With three decks to rock your rocking chairs on, along with hot tub and gas grill for essentials on the outside, and with pool table and half a dozen flat-screen TVs on the inside – with wifi throughout – there are plenty of amenities on the inside as well to relax and have fun in comfort. Spacious 3-bedroom cabins such as Mountain Memories Retreat can also be perfect for the solitary couple looking for a quiet getaway. Even sharing is an option – cabins like this are big enough that two couples sharing a 3-bedroom, for example, means there’s plenty of space to spend private time AWAY from your friends, yet still have them around for outings, meals and fun things together. So whether it’s just you, or you and the crew, Mountain Memories Retreat awaits, in quiet splendor, filled with light, and ready to entertain and accommodate. And we’ll keep the hot tub simmering for you! Click here to check availability and book Mountain Memories Retreat for your next trip! The cost savings of sharing with other people makes it fun to grab friends or family and bring them along on your trip. Splitting the costs of a three-bedroom among two couples can often come out about the same as renting your own 1-bedroom. This is especially true of the short-notice special offers such as half-price weekends, that often apply only to the 3-bedroom and bigger cabins. These deals can quickly bring the cost of a larger cabin down close to that of a one-bedroom cabin.